The eagerly anticipated second instalment of 90min's power rankings for British players in Germany's top two divisions is finally here and there has already been some movement, even though three of them didn't add to their first team minutes last weekend. Borussia Dortmund still sit at the top of the Bundesliga while Bayern Munich, Borussia Mönchengladbach and RB Leipzig are all within touching distance. Top flight giants Schalke 04 can't claw their way out of an apparent relegation fight, while there are seven teams separated by six points looking to gain promotion from the 2. Bundesliga this season. But away from all that, here's what everyone came for - 90min's power rankings for the Bundesliga Brits after matchday 23. Keanan Bennetts is still waiting for his first team call up but it could be just around the corner as he's returned from muscle strain which he picked up before the start of the Rückrunde. ​If the Bavarian derby wasn't bad enough for Reece Oxford's Augsburg, the weekend's hammering at the hands of SC Freiburg has ensured that the Fuggerstädter are going to be part of the relegation dog fight this season. After seeing five goals fly past him from four different goalscorers the on-loan West Ham defender was sent off in what initially seemed like a harsh decision. But replays showed that Oxford's attempted tactical foul resulted in him stamping on Janik Haberer's achilles and the 20-year-old rightfully made the walk back for an early shower. Arsenal loanee Emile Smith Rowe is still waiting for his chance with Germany's most hated club RB Leipzig, as the 18-year-old continues to overcome a groin strain. Smith Rowe will be confident of breaking in alongside the likes of Timo Werner and Emil Forsberg, however, as the Red Bulls' draw with Hoffenheim on Monday was just their latest hiccup in the race for Champions League football next season. It's been a strange start to life in Gelsenkirchen for former Manchester City winger Rabbi Matondo. The 18-year-old has featured three times for Domenico Tedesco's side and will continue getting first team chances thanks to their DFB-Pokal win over Fortuna Düsseldorf, but the Royal Blues are winless in the Champions League and Bundesliga since Matondo's arrival. He was most recently an unused substitute as Schalke suffered a 3-0 defeat against FSV Mainz 05, a result which has left the club dangerously close to the abstiegszone (relegation zone). 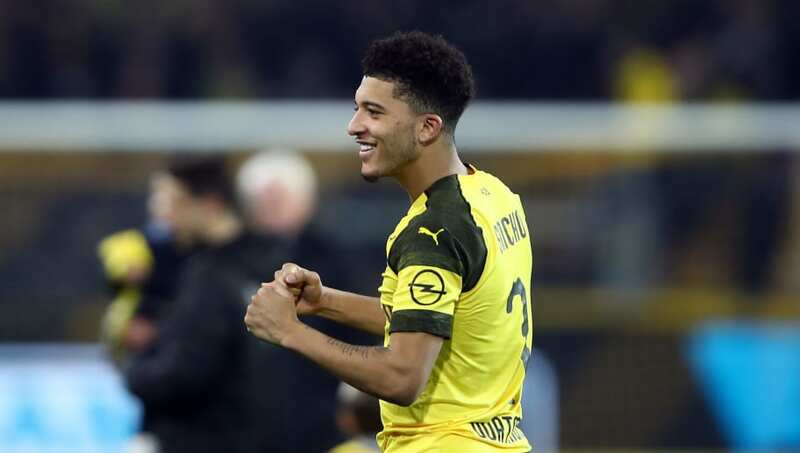 Reiss Nelson was being tipped as the next Jadon Sancho after he took to life on loan in the Bundesliga like a duck to water, where he scored six goals in his first seven Bundesliga appearances. But the Arsenal loanee hasn't claimed a goal or assist since November and has slowly been dropping out of TSG Hoffenheim's first team. He did make a cameo appearance against RB Leipzig on Monday but he couldn't do anything to stop defender Willi Orban equalising in the last minute of the game, cancelling out Andrej Kramarić's opening goal. No one has made a bigger move up the power rankings this week than defender Chima Okoroji, who made just his second ever appearance for SC Freiburg during their incredible 5-1 win over relegation candidates FC Augsburg. Okoroji was on the pitch for 86 minutes as star striker Nils Petersen scored twice, while goals from Vincenzo Grifo, Luca Waldschmidt and Florian Niederlechner ensured that Christian Streich's side have moved 11 points clear of the relegation zone. The Breisgau-Brasilianer are one of the smallest clubs in the top flight in terms of budget and stadium size, but they're on course for a fourth straight season in the Bundesliga. Hamburger SV might have lost their 2. Bundesliga clash with SSV Jahn Regensburg, finishing the game with just nine players after Orel Mangala and Vasilije Janjičić received second-half red cards, but it was a landmark day for Scotland international David Bates. The 22-year-old scored his first ever goal for Der Dino and despite his efforts to play down the strike - he claimed after full time that he "can't be pleased" as Hamburg lost - it will be a day that Bates won't be forgetting for a long time. Whatsmore, even though promotion rivals FC Köln, Union Berlin and St. Pauli all added to their points tally, Hamburg remain in pole position for automatic promotion back into the Bundesliga. The days of Jadon Sancho being considered as 'that English guy at Borussia Dortmund' are certainly nearing an end. Once again the 18-year-old had an outstanding performance for Lucien Favre's title contenders and he was arguably the best performing player throughout the entire Bundesliga on matchday 23. Sancho set-up Dan-Axel Zagadou to open the scoring against Bayer Leverkusen. Peter Bosz, who was back at the Westfalentadion for the first time after being sacked by Dortmund, saw his team get back on level terms through Kevin Volland. Just a minute later, however, Sancho put the hosts back in front with a technically perfect volley into the far corner of Lukas Hradecky's net, a strike which was probably his best since joining the club in 2017. Mario Götze then ensured Borussia Dortmund would extend their lead at the top of the table back to three points with a smart finish from the edge of the penalty area, leaving Jonathan Tah's late header as nothing more than a consolation goal.